Develop core capabilities to make the right connections that underpin digital customer experience. Designing and delivering a stellar digital customer experience strategy can be daunting for any firm. However, the task is now a future-proofing requirement for organizations across industries. 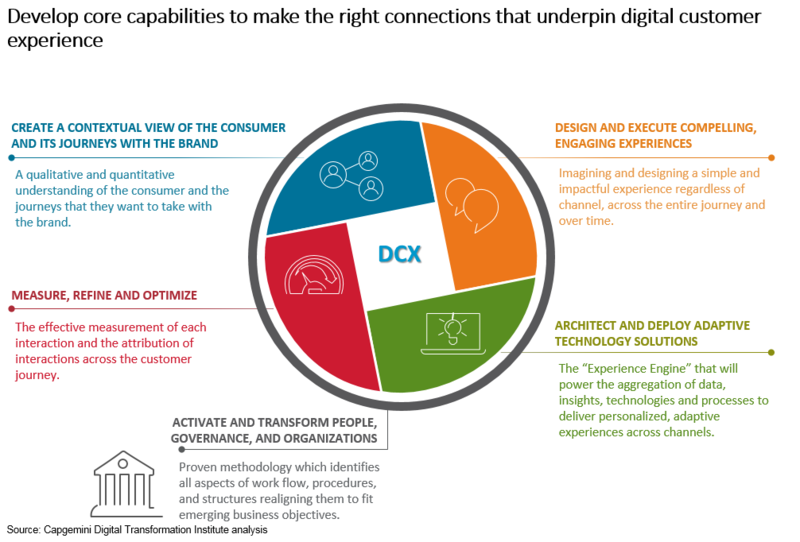 Achieving stellar DCX often includes both organizational and technology challenges, with businesses struggling to cross hurdles ranging from a lack of financial resources to the pressures of customers’ continuously rising tech expectations. Nevertheless, based on our research and experience working with leading organizations to establish best practices, Capgemini believes that teams can tackle these challenges through a measured step-by-step approach. First, appoint a DCX champion and draft a vision that aligns executives around the customer experiences that matter most. Set up a governance model that includes both IT and business stakeholders and decide where to begin. Design the most suitable digital customer experience and arrange the organization and investments around it. For leaders to succeed, they must understand which experiences matter and where to begin. Customer experience is about creating connections, both external (with the customer) and internal (with business units and functions). Organizations that create strong links between business operations and customer experience metrics enjoy greater benefits. Begin implementing basic DCX initiatives and earn some quick wins. Then, once fundamental actions are successful, work to develop internal skills and capabilities needed for more advanced projects. A digital talent pool and skills set that can grow with the firm’s enhanced DCX practices are essential. As the firm’s DCX initiatives start to take root, take action to ensure they can scale and mature. Now is the time to put next-level, differentiating efforts in place that offer customers an omnichannel service based on seamless execution across multiple physical and digital channels. In parallel, fine-tune products or offerings based on customer feedback and use. Standardize digital customer experience practices across the organization and link business operations with DCX key performance indicators. What’s more, always proactively communicate with consumers throughout the customer journey. Expect that customers’ expectations will continue to change and grow and that new agile entrants will continue to spring up ready to vanquish their pain points. Stay sharp by linking business operations with customer experience metrics and benchmarking initiatives by providing a seamless cross-channel experience. Use digital tools to monitor the customer journey in real-time. Continuously measure, refine and optimize customer interactions across their journey. Actively promote loyalty and referral programs on digital channels. It goes without saying that commitment to customer data security and privacy practices will help to assure consumers’ peace of mind. Consider measures such as empowering customers to view, edit and remove their personal data, making data privacy and security policies transparent, offering fair value in return for customers sharing their data, and safeguarding customer data from breaches and theft. Capgemini Digital Transformation Institute, The Disconnected Customer: What digital customer experience leaders teach us about reconnecting with customers, 2017.